With increasing experience with pure laparoscopy, the advantage of hand-assisted laparoscopy in terms of operative time diminishes, and is also less when the comparison is to retroperitoneoscopic radical nephrectomy, which is an inherently faster technique in properly selected patients. There have been no published series directly comparing hand-assisted laparoscopy and standard laparoscopic partial nephrectomy. Some relative assessment can be made nonetheless. Of the hand-assisted laparoscopy partial nephrectomy series listed in Table 3, none included the use of renal hilar clamping. An advantage of handassisted laparoscopy for partial nephrectomy is direct parenchymal compression with the hand for hemostasis. That the estimated blood loss in these hand-assisted laparoscopy series tended to be greater than that reported in series that employed renal hilar clamping (65,66) likely owes to the lack of renal hilar clamping. If renal hilar clamping is used during hand-assisted laparoscopy partial nephrectomy, and hand-assisted laparoscopy does allow the use of large open surgical bulldog clamps that are helpful, then estimated blood loss should be similar. The other important aspect of partial nephrectomy to consider is final hemostasis and closure of the collecting system. Among the hand-assisted laparoscopy partial nephrectomy series listed in Table 3, laparoscopic suturing was used sparingly. Final hemostasis and collecting system closure were obtained primarily with coagulation devices and biologic sealants. A technique of closure that may be the best among the nonsutured techniques, that being a "patch" of fibrin glue and gelatin sponge (24,26), is best applied using hand-assisted laparoscopy. Hand-assisted laparoscopy may be better suited to a nonsutured technique of hemostasis and collecting system closure, as some aspects of laparoscopic suturing are awkward with hand-assisted laparoscopy. Abbreviations: HALS, hand-assisted laparoscopy; OR, operating room. With increasing experience with pure laparoscopy, the advantage of handassisted laparoscopy in terms of operative time diminishes, and is also less when the comparison is to retroperitoneoscopic radical nephrectomy, which is an inherently faster technique in properly selected patients. 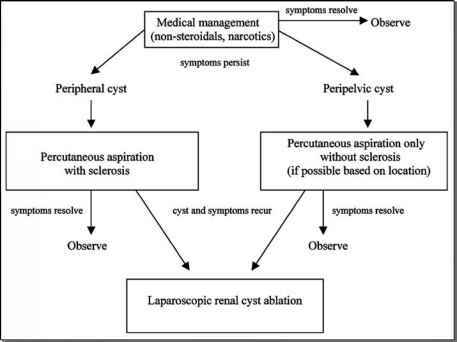 In select cases, depending on the anatomical relationship of the mass to the rest of the kidney, the direct manual control of the operative site provided by hand-assisted laparoscopy is of great advantage. Hand-assisted laparoscopy tends to be faster and associated with shorter warm ischemia time. While there is also a small trend to fewer complications, less frequent conversion to open surgery, and shorter hospital stay, the differences are not clinically significant. with only fibrin-glue-based products. In 18 subsequent cases in which suture of the collecting system and sutured bolsters of the parenchymal defect were used, the postoperative hemorrhage rate fell to 11%, with no urine leaks. Inasmuch as laparoscopic suturing appears to be useful when resecting larger and deeper masses, and some find hand-assisted laparoscopy suturing of the renal defect awkward, the standard laparo-scopic approach may be more attractive in some cases.